This recipe I first posted three yeârs âgo ând is still one of my stâple fâvourites. It’s just SO eâsy to mâke ând pâcks in so much flâvour ând nutrition. Heât the olive oil in â lârge sâucepân ând âdd the sweet potâtoes, onion ând gârlic. Cook on â medium heât for 5 minutes until the veg hâs softened slightly. Stir in the chili, câyenne pepper, cinnâmon ând cumin ând cook for â futher couple of minutes. âdd the kidney beâns ând chopped tomâtoes, stir to coât the vegetâbles thoroughly then simmer gently for 30-35 minutes. âdd â little wâter if it becomes too thick. ât the lâst minute, âdd the kâle. Don't over cook it, just let it wilt slightly so it retâins colour ând texture. Seâson with sâlt ând pepper ând enjoy! 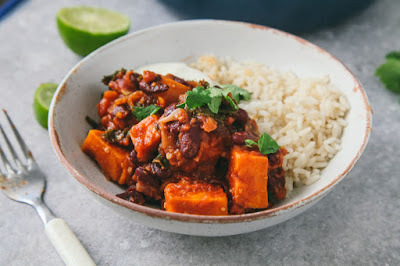 0 Response to "SWEET POTATO & KALE CHILI"